Before the artist begins sketching out the images that will appear on the thangkha, they must first determine the division of space on the canvas. First, by using chalk lines and a compass, the true center of the canvas must be found. Second, both the horizontal and the vertical axis must be established. In this way, the artist can allocate space to the images according to hierarchy and the number of images that need to be represented. These diagrams show the most common designations of space although there are variations. However, even with variations, the position of the retinue in relation to one another remains the same. The retinue are positioned according to their association with the directions. 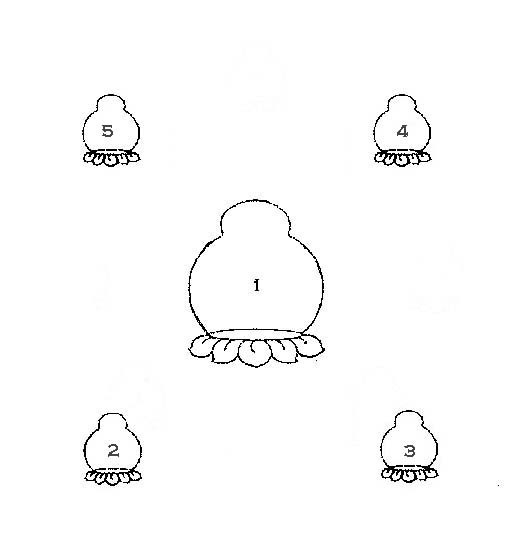 In the text, the detail of the deities position begins with the center and is then listed the Bön way, or counter-clockwise, beginning with the East. Referencing the diagrams above: 1=Center, 2=East, 3=North, 4=West, 5=South, 6=Southeast, 7=Northeast, 8=Northwest, and 9=Southwest. Most often, but not always, the deities are the color associated with the direction. East=yellow, North=green, West=red and South=blue. 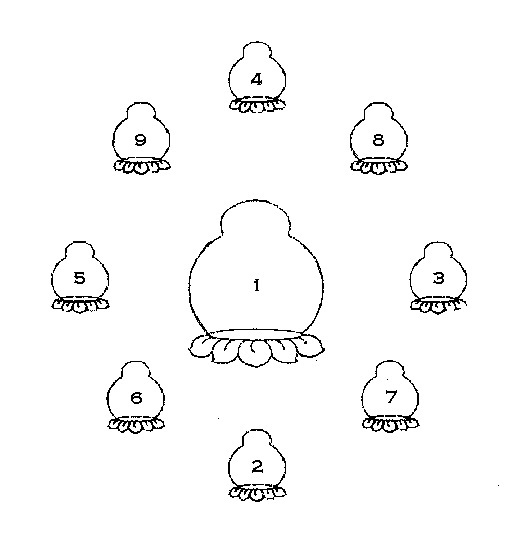 Here, the deities of the Five Buddha Families are positioned according to diagram 1 above. In the center is the Enlightened One, Künang Kyapa and consort. In the east is the Enlightened One, Salwa Rangjung and consort. In the north is the Enlightened One, Gélha Garchuk and consort. In the west is the Enlightened One, Jedrak Ngomé and consort. And in the south is the Enlightened One, Gawa Döndrup and consort. 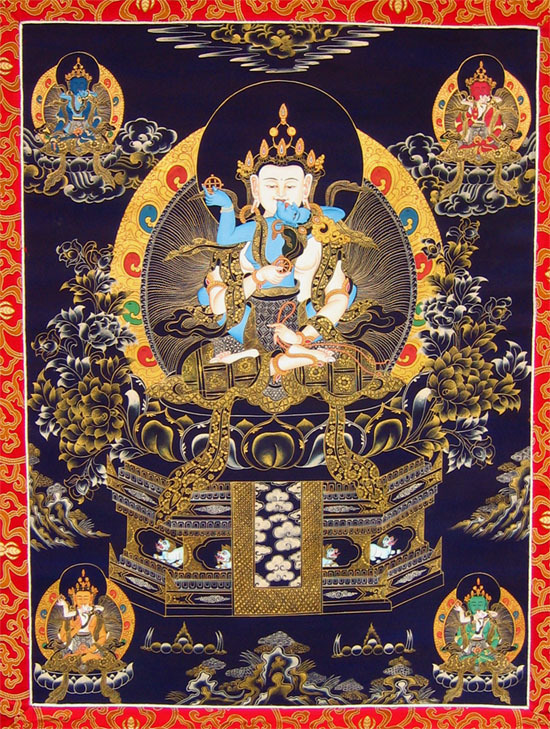 Posted on April 18, 2015, in Iconography, Preservation, Tibetan Culture & History, Uncategorized and tagged sacred art, spirituality, Tibetan history, yungdrung bon. Bookmark the permalink. Leave a comment.